Promising cures for blood-related diseases, such as leukemia and lymphoma, hematopoietic stem cells (HSCs) have been heavily researched for decades. However, like many significant findings in science, their discovery was not made in search for such a cure, but stumbled upon while dealing with another serious medical issue of the time: radiation. While trying to treat people exposed to lethal doses of radiation during World War II, transplants from the spleen and bone marrow were found to rescue these victims (Ford et al., 1956). It was not until later that scientists determined that the HSCs present in these tissues were what was restoring the damaged tissues, observed by performing transplants using lethally irradiated mouse and rat models (Becker et al., 1963). HSCs in humans were further characterized and cultured in the 1980s (Morstyn et al., 1980; Sutherland et al., 1989; Sutherland et al., 1990). The formation of the National Marrow Donor Program during this time also greatly improved the availability of these cells for research. Not only have HSCs been successfully used clinically in humans since the 1950s, but to this day they are still one of the few adult stem cells to be tested for clinical uses. It is now not only better understood how HSCs from a donor animal can save a lethally irradiated recipient animal, but how HSCs can be used in many other medical applications as well. HSCs are able to give rise to all cells in the hematopoietic system, which includes myeloid elements (i.e. red blood cells, white blood cells, platelets) and the lymphatic system (i.e. T-Cells) (Regenerative Medicine, 2006). Because radiation generally targets rapidly dividing cells, including bone marrow cells and cells in the lymphatic system, HSCs have the ability to replenish the supply of cells most damaged by radiation. While HSCs can be collected from adult bone marrow, some fetal tissues (liver, spleen, thymus), umbilical chords, and peripheral blood, in recent years there has been a great shift towards obtaining HSCs mainly from peripheral blood, using a much simpler and less controversial procedure, though achieving a large enough number of HSCs for transplants is still an obstacle to overcome (Stem Cells, 2001). HSCs are now being used to treat cancers of the hematopoietic system (leukemia and lymphomas), replenish cells lost to high-doses of chemotherapy, and fight against autoimmune diseases, in addition to other medical applications (Regenerative Medicine, 2006). 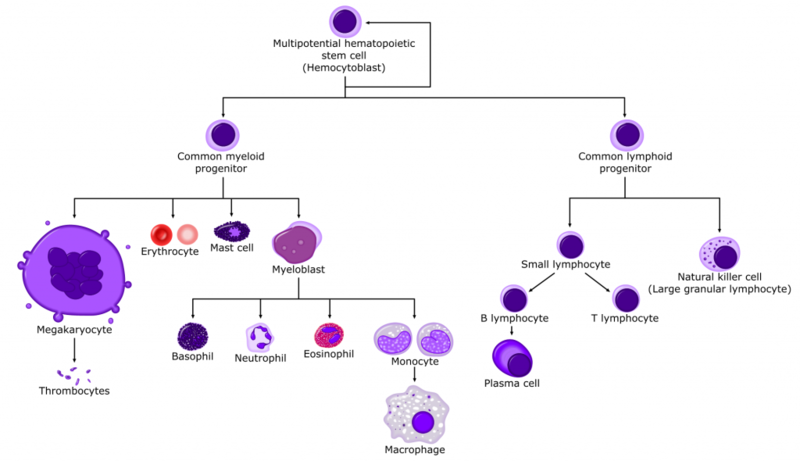 Hematopoietic stem cells give rise to two major progenitor cell lineages, myeloid and lymphoid progenitors (Regenerative Medicine, 2006). A rather unique, and not fully understood, characteristic of HSCs is their mobility; HSCs can travel out of the bone marrow and into surrounding tissues, such as peripheral blood, nearby bones, the spleen, and many other tissues. Multiple studies have shown that HSCs transplanted into a donor animal can travel to such areas especially when they are injured. Though the molecular method for the homing mechanisms is still being elucidated, it is thought that an injury causes a loss of cells normally functioning in the hematopoietic system and this loss must quickly be replaced by HSCs, which migrate to where they are needed and then differentiate into the required, lost derivatives (Whetton and Graham, 1999; Regenerative Medicine, 2006; Chamberlain et al., 2007). While HSCs have been clinically studied to a large extent relative to other human stem cells, much work remains to be done to fully understand their molecular interactions. Becker, A. J., McCulloch, E. A, and Till, J. E. Cytological Demonstration of the Clonal Nature of Spleen Colonies Derived from Transplanted Mouse Marrow Cells. Nature. 1963. 197:452-4. Chamberlain, G., Fox, J., Ashton, B., Middleton, J. Concise Review: Mesenchymal Stem Cells: Their Phenotype, Differentiation Capacity, Immunological Features, and Potential for Homing. Stem Cells. 2007 Nov;25(11):2739-49. Epub 2007 Jul 26. Ford, C. E., Hamerton, J. L., Barnes, D. W. H., and Loutit, J. F. Cytological identification of radiation-chimeras. Nature. 1956. 177:452–4. Morstyn, G., Nicola, N. A., and Metcalf, D. Purification of hemopoietic progenitor cells from human marrow using a fucose-binding lectin and cell sorting. Blood. 1980. 56:798-805. Sutherland, H. J., Eaves, C. J., Eaves, A. C., Dragowska, W., and Lansdorp, P. M.. Characterization and Partial Purification of Human Marrow Cells Capable of Initiating Long-Term Hematopoiesis In Vitro. Blood. 1989. 74(5):1563-70. Sutherland, H. J., Lansdorp, P. M., Henkelman, D. H., Eaves, A. C., and Eaves, C. J. Functional characterization of individual human hematopoietic stem cells cultured at limiting dilution on supportive marrow stromal layers. Proc Natl Acad Sci U S A. 1990. 87(9): 3584-8. Stem Cells: Scientific Progress and Future Research Directions. Chapter 5: Hematopoietic Stem Cells. Department of Health and Human Services. June 2001. Whetton, A. D. and Graham, G. J. Homing and mobilization in the stem cell niche. Trends Cell Biol. 1999. Jun;9(6):233-8. Original “Hematopoiesis” image from the Wikimedia Commons and redistributed according to the terms of the GNU Free Documentation License. admin	Hematopoietic Stem Cells	adult, clinical trials, hematopoietic, history	© 2009-2010, Teisha Rowland. All rights reserved.